It being the birthplace of coffee, combined with notoriously changing the perceptions of coffee drinkers about what coffee can taste like, Ethiopian coffees court especially high expectations and attention year after year. Perhaps more than any other origin, coffee roasters look to Ethiopia to provide both stand-alone knockouts, as well as that little something to round out an espresso blend. Time and time again, the “Queen of Coffee Origins” delivers, despite a frankly labyrinthine and constantly evolving coffee auction and export system. Year after year, coffee buyers eagerly make their way through Addis Ababa and into the countryside, in search of the next fabled cup. Ethiopian coffee is still made up of many wild growing coffee plants – most of them have not yet been classified, so the genetic diversity is innumerable and is still very much being studied and explored. While varieties do change from region to region within Ethiopia, you will often see “landraces” or “heirloom” listed as the varieties, even though this does not denote a homogenous genetic pool covering all of Ethiopia. Being wild, these varieties have evolved naturally and so are well adapted to their surroundings. All this means that chemical inputs (fertilizers), pesticides, herbicides and fungicides are rarely needed/in use in Ethiopia; the majority of coffee produced is organic in the truest sense of the word. Our washed coffees are carefully selected, rigorously sorted (by both machine and hand) and curated together with Heleanna Georgalis of Moplaco Trading Co. Heleanna and her team purchase coffees from the Ethiopia Commodities Exchange (ECX) and once the coffees arrive at their facility in Addis, they are meticulously sorted so that the full potential of each lot is clearly distinguishable. The current iteration of the ECX is structured in such a way that transparency (i.e. knowing the specific people involved with harvesting, and the place the coffee was grown and processed) is not available. Licensed exporters like Heleanna purchase coffees based on three criteria: broad geographic areas (e.g. Yirgacheffe, Sidamo), quality grade as determined by the ECX (e.g. Q1, Q2), and the lot’s date of submission to the auction. Bidders are not allowed to see or taste the coffee prior to bidding. These realities are why the work of Heleanna’s processing and export team is so fundamental to the quality of the coffee our roasters receive; it’s why we consider Moplaco to be a “producer”. 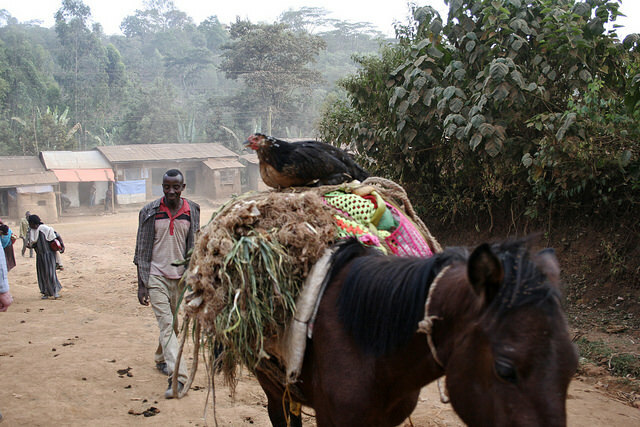 Moplaco's natural coffees are produced at its commercial farm, which also works together with neighbouring smallholders. The region these coffees are grown is near Gedeb at about 1880 meters above sea level, with red soil. It is on the borders of Yirgacheffe and Guji, which are separated by about 10km of distance. The number of farmers that supply the cherries is around 200, but this number can change depending on the price. Farmers are paid twice: once when the cherries are initially delivered to the washing station and secondly through a percentage dedicated to community projects, such as schools. For example, a school in Yirgacheffe was built from this percentage in the past and is now being financed by current proceeds. Another school near the farm is also being supported in this way. The natural coffee process starts just as washed coffees do: red, ripe cherries are collected and then sorted within four hours after they have been picked from the trees. These cherries are spread on raised African beds, where exposure to air helps dry the beans. The fact that the seeds do not touch the the ground and other foreign materials eliminates, as a first step, the risk of contamination, and subsequent defects that end up contributing to "earthy", and “soily” tastes. In the second phase of processing, full red beans are carefully selected and any broken, green, immature beans are eliminated from the beds. This drying and selection process goes continuously from 12 to 15 days. As the cherry dries onto the seed, a fermentation process takes place, which allows sugars to dry onto the seeds, leading to the development of a more complex, fuller bodied coffee, wherein more aromatic compounds can develop through the roasting process. Coffee stays in parchment for as long as possible. Ideally between 4-6 months, so that the many acetic acids that develop inside the parchment during the drying, once settled down, will not taste like vinegar. If coffee is hulled after 4-6 months, it will have more pronounced tastes, both in sweetness and flavour. 4-6 months is an ideal period to have the coffee’s acids and sugars settle, in order to develop a more sweet and aromatic profile. The fact that the coffee is from Yirgacheffe adds to its prestige, as the coffee is genetically supreme. What a careful sundried process does is maintain this supreme character and allow it to develop properly. Garden coffee: coffee grown and harvested on smallholder property. Semi-forest coffee: coffee that grows under a forest canopy. The land below the canopy belongs to a farmer who produces coffee in addition to other crops. Forest coffee: coffee grown in forests protected by the Ethiopian government. People are given permission to harvest cherries. No people-induced cultivation is allowed. Plantation coffee: coffee grown on privately owned commercial farms. Smallholder: coffee farmers owning smaller plots of land. Collector: a person that bought coffee cherries and in turn sold to suppliers (i.e. washing stations). In the current version of the ECX, there are no longer collectors. Supplier: washing stations that are owned by a private person, or a cooperative. They deliver processed coffee to the ECX. Exporter: can be a private person/company, a commercial farm, a union (usually supplied by cooperatives), or a government plantation. Commercial farms can only export their own production. The ECX auction system was established in 2008 and is a private company made up of private parties and the Ethiopian government. It was set up, ostensibly, to protect the rights of all parties involved, from sellers, to buyers, to intermediaries. During its early iteration, smallholders sold their cherries to a collector, who bought cherries from throughout their area and in turn sold to suppliers/washing stations. Collectors had to obtain licenses in order to buy from their specific areas (e.g. Kochere), to which they had to strictly adhere. Once processed by a washing station, coffee was delivered to the auction in Addis and were cupped and graded by the Coffee Liquoring Unity (CLU). Auctions occurred daily and exporters had the opportunity to see the samples, which together with the coffee’s region, is what they based their purchasing decisions on. In this early system, the name of the region (e.g. Yirgacheffe) as well as its specific locality (e.g. Kochere) and sub-locality (e.g Chelelektu) were transparent. Also available was the name of the supplier/washing station. Notably, exporters did not have the opportunity to cup these samples; only look at the sample and see its lot info. This is in contrast with other auction systems, such as Kenya’s (for example), where exporters routinely cup coffees they’re interested in. Once the auction ended, the trucks containing the lots were sent to the exporter’s warehouse within the same day. This allowed for good quality control—trucks delivering coffee that did not match the sample could be sent back—and it allowed for price discovery via the knowledge about specific geographic origin and the exporter’s knowledge of demand for the various regions. One downside and perhaps a subsequent reason that the ECX was changed is that certain suppliers and exporters would enter into prior agreements so that the supplier could end up withdrawing from a sale if the highest bidder was not the same person it entered into a pre-arrangement with. In the newer version of the auction, which was implemented quite soon after the first version of the ECX, collectors were eliminated and centralized marketplaces were implemented. So now, rather than suppliers buying from collectors or specific smallholders, they buy from centralized markets: cherry prices are based on the “market price”. One big effect of this change is that suppliers can no longer negotiate prices based on whose cherries they like better: they have to buy lots based on what’s available at the market. Once the coffee (in parchment for washed; hulled for natural) arrives at the specific auction allocated for that particular region (e.g. Dilla auction for Yirgacheffe region), it is cupped and graded by the ECX lab within the facility, each truck that contains specific lots from specific washing stations is given a number so that its identifying information is only known by the Ministry of Agriculture, and exporters purchase based on the region and ECX grade. For washed Yirgacheffe coffees, there is an additional identifier: type A are coffees that have the “Yirgacheffe flavour” and type B are coffees that do not have the “Yirgacheffe flavour”. Washed and natural coffees have slightly different classifications. Yanni Georgalis established Moplaco in 1972 and was a third generation coffee exporter. Yanni was highly respected not only within Ethiopia but was well known and beloved by buyers of Ethiopian coffee around the world. He rightfully maintained a reputation for not only selling the highest quality coffee, but also for his integrity in all aspects of the business. Heleanna, Yanni’s daughter, then comes from a long and established lineage of highly respected Ethiopian coffee exporters. Heleanna is a courageous woman and has done an admirable job of continuing the legacy of her father’s at Moplaco while also carving out her own version of it in the years since her father’s passing. Under her leadership, Moplaco is constantly evolving to produce ever-increasing quality coffee in spite of the complexity and challenges continually present within Ethiopia’s coffee production and auction systems. Born in East Harar Heleanna, as a young girl, was forced to flea her home in the face of civil war and so grew up and was educated in and around Europe, where she eventually established a successful career in finance. 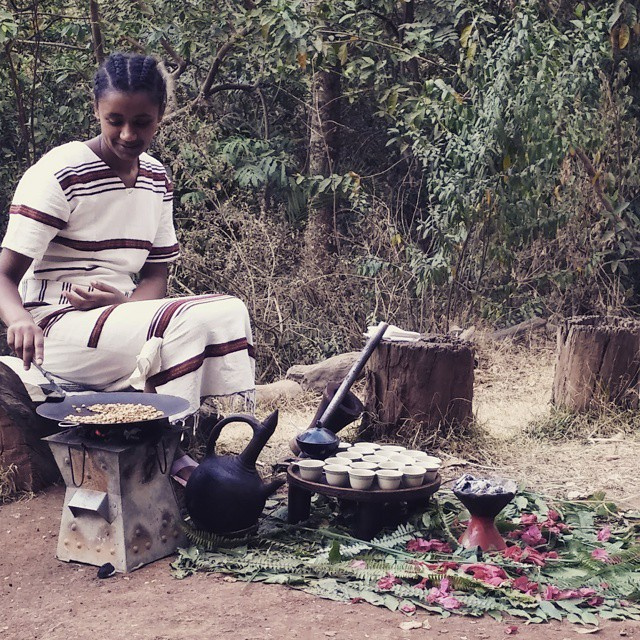 She neither imagined nor planned to find herself back in Ethiopia and working in the footsteps of her father within the world of specialty coffee. After the sudden passing of her father in 2008, Heleanna was faced with a difficult crossroads: continue the legacy her father had meticulously built with almost no knowledge about the coffee business, or continue on the path she had created for herself within the world of finance. We are very glad and lucky she chose coffee. True to her personality and way of approaching new challenges, Heleanna completely immersed herself in learning about roasting, cupping, agronomy (including the latest research and practices in natural processing) and the niche markets of specialty coffee all around the world. Though she admits that these challenges were extremely daunting at times—and sometimes continues to be—Heleanna continues to trailblaze her way through specialty coffee and is consistently updating herself on the latest trends and experiments in agricultural and processing techniques, travelling around the world to meet with and discuss these developments with the best and brightest producers and coffee researchers. With all the experience and knowledge he had amassed on the multitude of distinct cup profiles found in Ethiopian coffees—as influenced by species, geographic location, processing practices—Yanni developed a line of Moplaco green coffee brands that are based on some of the most distinct, well-known and loved cup profiles coming from Ethiopia. Given the ECX’s built-in lack of traceability, these brands are especially relevant today and we’re proud to present them now in 2015. Matahara: Is a coffee from the West of Ethiopia. It has a flavour profile that is spicy, very sweet, full body and has a medium pointed acidity. Matahara means “new brain” in the language of Oromifa, and it was chosen to indicate the new idea Yanni had at the time he created it. Abysinian Mocca: Many people identify Ethiopian coffee as coffee with the “mocca” flavour. This can mean different things to different people, but for Moplaco, the mocca profile has a dark chocolate flavour, is very clean with full body, and a good acidity. Abysinia is the ancient name of Ethiopia. To Moplaco, this coffee represents the epitome of Ethiopian coffee. Illily: This coffee comes from the Lower West lands of Ethiopia, under deep forests and wild nature. The coffee’s cultivation goes from the lower lands around 1600 meters above sea level, to the highlands at 1800 metres. “Illily” means flowery in the Oromifa language, which is well represented in the cup. This coffee also has a notable citric characteristic that is well balanced with its floral attributes.